bZipt Zippered Fleece Leggings. 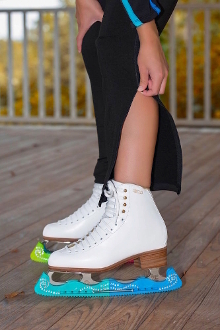 A revolutionary way to put on and take off leggings without removing shoes, boots, or skates! Easily go from daily wear to sporty, change anywhere, or layer over bike shorts for warmth and to prevent skinned knees. Zips below waist to ankle. Soft and comfortable. Great for Gymnastics, Dance and Skating.